From the Pulitzer and Story Prize winner: sixteen new stories—provocative, funny, disturbing, enchanting—that delve into the secret lives and desires of ordinary people, alongside retellings of myths and legends that highlight the aspirations of the human spirit. 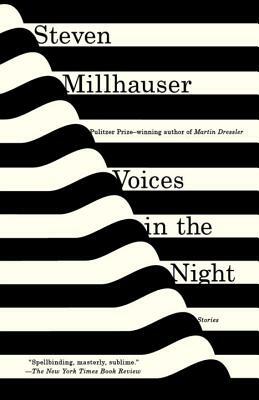 Beloved for the lens of the strange he places on small town life, Steven Millhauser further reveals in Voices in the Night the darkest parts of our inner selves to brilliant and dazzling effect. Here are stories of wondrously imaginative hyperrealism, stories that pose unforgettably unsettling what-ifs, or that find barely perceivable evils within the safe boundaries of our towns, homes, and even within our bodies. Heightened by magic, the divine, and the uncanny, shot through with sly and winning humor, Voices in the Night seamlessly combines the whimsy and surprise of the familiar with intoxicating fantasies that take us beyond our daily lives, all done with the hallmark sleight of hand and astonishing virtuosity of one of our greatest contemporary storytellers. STEVEN MILLHAUSER is the author of numerous works of fiction, including Martin Dressler, which was awarded the Pulitzer Prize, and, most recently, We Others: New and Selected Stories, winner of the Story Prize and a finalist for the PEN/Faulkner Award. His work has been translated into seventeen languages, and his story “Eisenheim the Illusionist” was the basis of the 2006 film The Illusionist. He teaches at Skidmore College and lives in Saratoga Springs, New York.